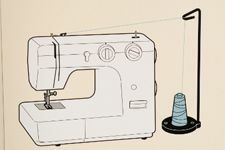 30 and 40 Weight - Weight refers to a thread's thickness. 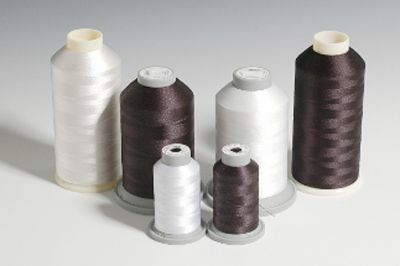 With embroidery thread, a lower weight means a thicker thread. 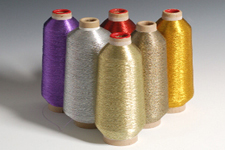 Specifically, our 30 Weight embroidery thread is heavier than our 40 Weight thread. 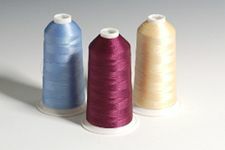 40 Weight thread is more popular because it can be used to embroider both small areas (e.g. a Polo logo) and larger areas (e.g. numbers on a football jersey). 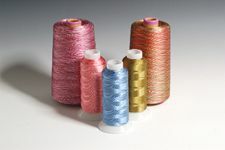 30 Weight thread is often a better choice for large areas. 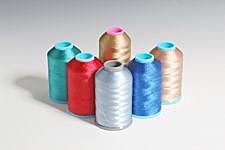 It covers them faster with less stitches because it is thicker, and it is indistinguishable from 40 Weight thread. 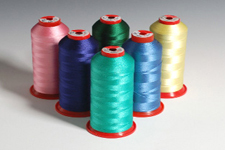 Using 30 Weight thread requires a larger needle and more machine tension. 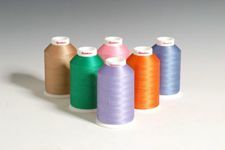 Our top-of-the-line embroidery thread. All colors / all sizes. Polyester, Rayon, Metallic, Moonglow, Variegated, Twister Tweed. 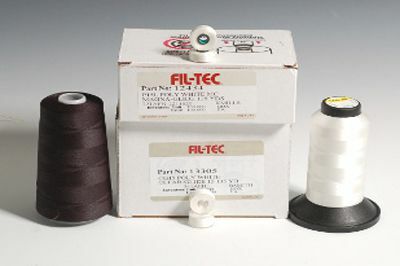 Fil-Tec and Marathon black and white embroidery thread. Mini spools for $4; King spools for $7. Monofilament thread thread in clear and smoke. All sizes. 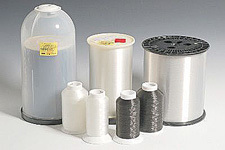 Small spools, canister refills, and canister cases that save 15%. 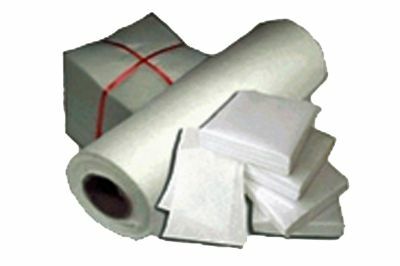 Lovett backings and stabilizes in retail and commercial packages - cutaway, tearaway, tearaway / cutaway, and water soluble. 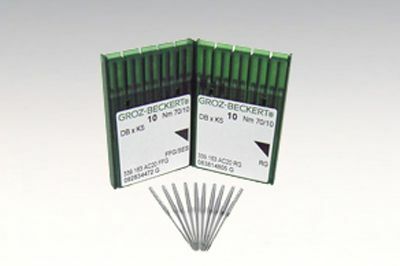 All Groz-Beckert machine needles. Home Machine Needles, Machine Embroidery Needles. C.S. 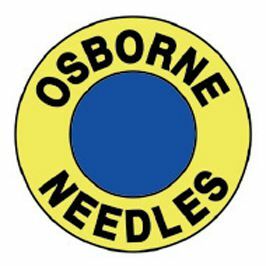 Osborne needles for hand sewing, fabrics, darning, chenille, and tapestry. Style L bobbins for home machines and low cost bobbin thread for those who wind their own bobbins. 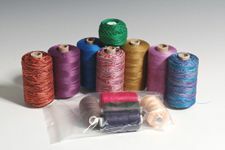 Stop thread puddling by wrapping spools in reusable thread sock. White netting $2.00 a yard; yellow netting $1.50 a yard. Our thread cone adapter lets you use money-saving king spools with any sewing machine. Avid sewers here is an inexpensive way to build a thread stash. 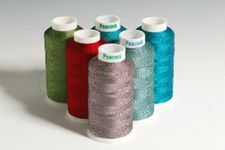 For example, you get 5 to 7 partial embroidery thread cones for $2 a pound. 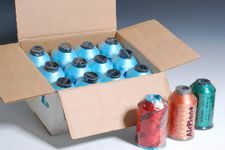 Embroidery king spool cases - 12 spools for $12. 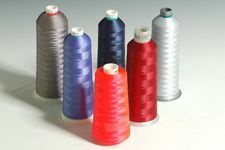 Most spools are Salus, 30 weight rayon. We have about 100 colors. 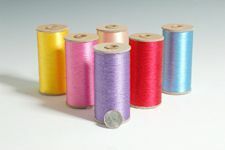 ARC (Melco) rayon embroidery thread on 5,500-yard king spools. About 75 colors for $3 each. Madeira rayon and polyester embroidery thread on 5500-yard king spools for $6 a spool. Just 40 colors left. 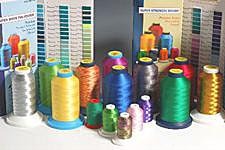 A&E Signature Polyester embroidery thread on 5500-yard king spools for $5 a spool. About 40 colors in stock. Sylko polyester embroidery thread on 5500-yard king spools for $6 a spool. About 20 colors left. 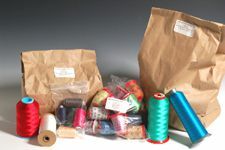 Mixed brands of rayon embroidery thread on 1100-yard mini spools for $1.00 each. 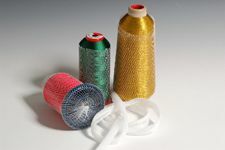 Metallic embroidery thread on large 5500-yard cones. Just four colors left. Closeout price $10. 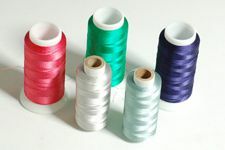 Variegated rayon embroidery thread. Peacock 3,300-yard king spools for $4; giant 25,000 cones for $10. Peacock, two-tone tweed embroidery thread on 2750-yard king spools for $4 a spool. Thread for giant embroidery machines now repurposed for hand embroidery and some machines. Single spools for $2; 20 spools of the same color $15. 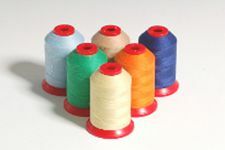 Robison-Anton spun polyester sewing thread on 700-yard mini spools. Use for garment sewing and repair. $1.50 each. Valdani hand-dyed cotton thread in 35 and (lighter) 50 weight. Over 100 solid and variegated colors.